Janetta wished to share her dehydrated potato beaded necklace with us. Prior to her success, she wrote to ask how to dehydrate potatoes for stringing into necklaces! Well, to be honest, I didn't know a thing about it, so Janetta promised to try her hand with the necklaces on her own. I'd say she was very successful; she sent in these lovely pictures to prove it! She doesn't currently have a dehydrator. So she did the next best thing: she used her regular oven, set at 170°F for two hours. She then left the potatoes in the oven until the next day. "They Turned Out Like Rocks!" Janetta says "they turned out like rocks but I guess that isn't bad!" She also noted that she should have cut the potatoes into larger pieces (even though she did consider shrinkage), they did dry too small, in her opinion. Janetta also thinks that the beads were too small and some got lost in the potato indentations! Still, it was her first try and she and her friends were pleased with the effort. Fast forward to today, March 12, 2013, and Janetta sent two more lovely photos of her beads. This batch of beads were dried at 200°F for three hours, and were made from three large potatoes. Janetta ended up using a skewer to make the holes! Use a Skewer to Make Holes! 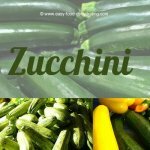 "They are like rocks and hard to force holes after they are baked," says Janetta, and she reminds us to make sure the holes are big prior to dehydrating. I asked her what she painted them with. "I painted them with turquoise acrylic paint and I intend to put some kind of sealer on them." 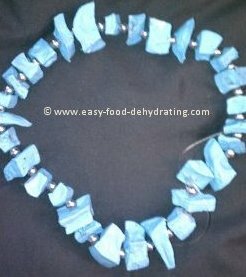 Pretty Dehydrated Potato Beaded Necklace! To add decoration and spacing between the turquoise spuds(!) she strung them with silver beads on nylon jewelry cord. She said the nylon cord was stiff enough that she didn't need to use a needle. While Janetta fully intended to make one strand long enough to drop over her head, the strings were too short this time around. "This was a two-day process," says Janetta. "I could have put two beads in between each potato but didn't think of it at the time. It took a long time to paint them!" she added. 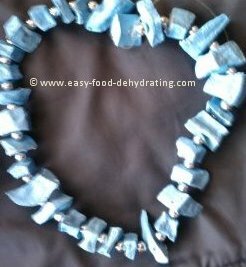 Thank you Janetta for sharing your dehydrated potato and bead necklaces with us! Here's more inspiration for potato bead necklaces.